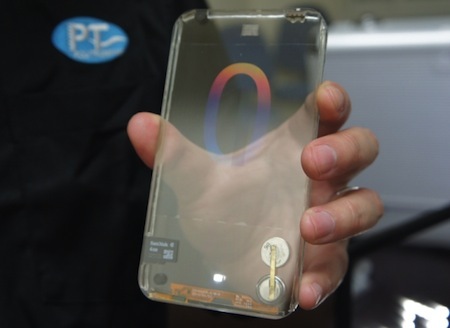 Take a look at (or through) this prototype transparent smartphone from Taiwan's Polytron Technologies. Polytron’s system uses Smart Glass which looks opaque when the power is off, but which becomes transparent when turned on. In the prototype you can see a few components that aren’t transparent including the microSD card, speakers, and batteries. The bottom part could be darkened so you wouldn’t have to look at the visible components (although I think it’d be kind of cool to see the guts of the phone). There’s no software (and not much hardware) in this protoype, and it could be a few years before a fully functional transparent phone is available for purchase… if one ever actually hits the market. While the idea is certainly pretty cool, I have to wonder how useful a transparent display wold be in a handheld device — since you’d probably spend most of your time staring through the phone and into the palm of your hand. Transparent displays will likely be much more useful for in-vehicle display systems, smart glasses, and other products where you’re not expected to hold the transparent device in your hands. 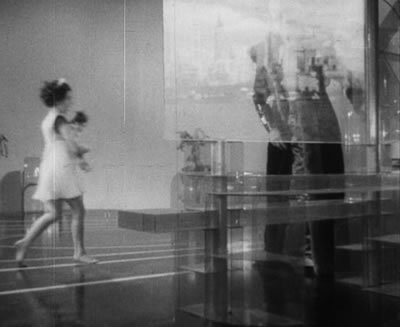 As you see in the screen capture below from Wells' prophetic 1936 film Things to Come, the technologically advanced society of the future makes use of widescreen transparent flat panel technology (see more pictures). As I recall, there was also a smaller version for desktop use.